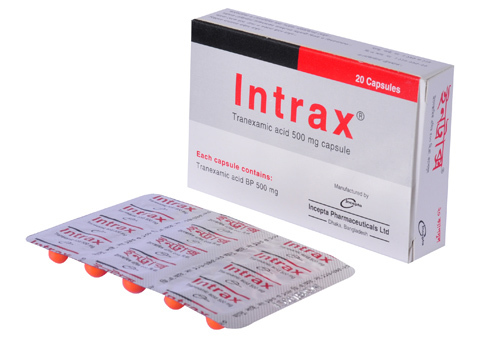 Intrax Capsule: Each capsule contains Tranexamic acid BP 500 mg.
Intrax Injection: Each 5 ml ampoule contains Tranexamic acid BP 500 mg.
Tranexamic acid has a strong inhibitory effect on the activation of plasminogen, i.e. the conversion of plasminogen to plasmin, in the fibrinolytic system. The half-life is 1-2 hours. Plasma protein binding is 3% at therapeutic levels. The plasma protein binding seems fully accounted by its binding to plasminogen. Tranexamic acid is excreted unchanged in the urine. Tranexamic acid is rapidly absorbed from the gastrointestinal tract. Maximum serum levels are reached within 2-3 hours. After oral administration, about 40% of the dose is excreted in the urine during the first 24 hours. After intravenous administration, 45% of the dose is excreted in the urine during the first day. General fibrinolysis as in prostatic and pancreatic cancer, after thoracic and other major surgery, in obstetrical complications such as abruptio placentae and post-partum haemorrhage, in leukaemia and liver diseases and in connection with thrombolytic therapy with streptokinase. Intravenous administration is necessary only if it is difficult to give adequate doses by mouth. The recommended standard dose is 1 to 1.5 gm or 5-10 ml by slow intravenous injection at a rate of 1ml/minute, two to three times daily. For the indications listed below the following doses are recommended. 1-1.5 gm orally three to four times daily for three to four days. 5-10 ml by slow intravenous injection every eight hours (the first injection being given during the operation) for the first three days after surgery; thereafter 1-1.5 gm orally three to four times daily until macroscopic haematuria is no longer present. 1.5 gm orally three times daily for four to ten days. 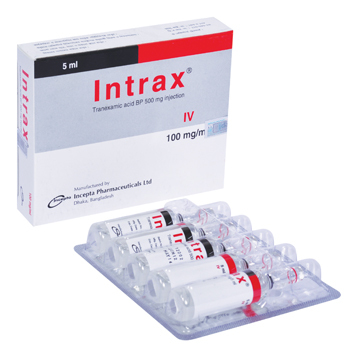 Intrax injection may be applied topically to the nasal mucosa of patients suffering from epistaxis. This can be done by soaking a gauze strip in the solution, and then packing the nasal cavity. 1-1.5 gm orally 2-3 times daily until macroscopic haematuria is no longer present. 1.5 gm orally 3 times a day for 12 to 14 days post-operatively. Immediately before surgery, 10 mg per kg body-weight should be given intravenously. After surgery, 25 mg per kg body-weight are given orally three to four times daily for six to eight days. Coagulation factor concentrate might be necessary to administrate. 1.0 gm (10 ml) by slow intravenous injection three to four times daily. With fibrinolysis in conjunction with diagnosed, increased intravascular coagulation i.e. defibrillation syndrome, an anticoagulant such as heparin may be given with caution. 1-1.5 gm orally two to three times daily as intermittent or continuous treatment depending on whether the patient has prodromal symptoms or not. Oral dose: 25 mg/kg 2 to 3 times daily for 7 to 10 days. Injection: 10 mg/kg 6 to 8 hours for 7 to 10 days. Dose-dependent gastrointestinal discomfort is the most commonly reported undesirable effect, but it is usually of mild and temporary in nature. Allergic skin reactions have been reported as an uncommon undesirable effect. Hypotension may occur after fast injection. Patients with irregular menstrual bleeding, patients with a high risk of thrombosis (a previous thromboembolic event and a family history of thromboembolic disease) should use it only if there is a strong medical indication and under strict medical supervision. Patients with disseminated intravascular coagulation (DIC), who require treatment with it must be under the strict supervision of a physician experienced in treating this disorder. In the long-term treatment of patients, regular eye examination should be performed. If a colour vision disorder occurs during the course of treatment, the drug should be discontinued. Pharmaceutical precautions: Intrax injection should not be mixed with blood for transfusion or infusion solutions containing penicillin. Pregnancy: Tranexamic acid crosses the placenta. Clinical experience of use in pregnant women is limited. Animal studies have not supplied any evidence of an increased incidence of foetal damage. Lactation: Tranexamic acid is excreted into breast milk, but it is not likely to influence the child at therapeutic doses.